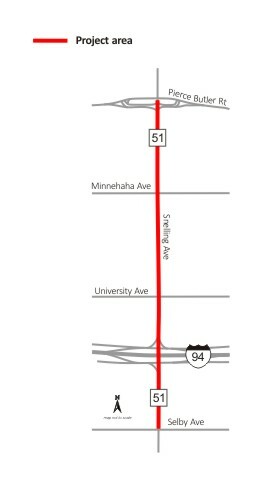 Motorists who use Snelling Avenue in St. Paul's Hamline-Midway area are in for a major traffic disruption this summer. The biggest impact of the $9.5 million project will be the four-month closure of the Interstate 94 overpass starting in May and lasting until about the time the State Fair begins in late August. Access to and from the freeway at Snelling will be closed and detoured periodically throughout the project. Several other upgrades along Snelling Avenue between Pierce Butler Route and Selby Avenue will affect 35,000 to 38,000 drivers from May to November. The Minnesota Department of Transportation, the City of Saint Paul and Metro Transit will hold an open house from 4 to 6:30 p.m. Monday in Room 112 of the Anderson Center at Hamline University to share details of the project. Motorists are already seeing the first signs of construction. Currently St. Anthony Avenue, the road that runs parallel on the north side of I-94 is closed between Pascal Street and Snelling Avenue to allow for utility lines to be moved. From May through November, MnDOT will construct station platforms for the new A-Line BRT Line, resurfacing pavement and updating pedestrian crossings to comply with standards set forth by the Americans with Disabilities Act. The project also calls for replacing some sidewalks, adding decorative street lighting and landscaping medians.